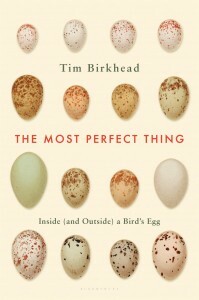 Renowned British ornithologist Tim Birkhead has spent four decades studying birds and their eggs, which he calls “independent, self-contained embryo-development system[s].” In The Most Perfect Thing, Birkhead takes us to the Bempton Cliffs on Britain’s East coast, the home of guillemots, kittiwakes, and razorbills, seabirds, from which eggs have been harvested since the late 1500s. There, he spins a tale of Yorkshire “climmers” who descend on ropes secured by anchormen to gather eggs for wealthy collectors, who helped to fuel public interest in birds and their eggs. As egg collections made their way from curiosity cabinets to public museums, a fascination with wild eggs arose along with a coincidental interest in ornithology. 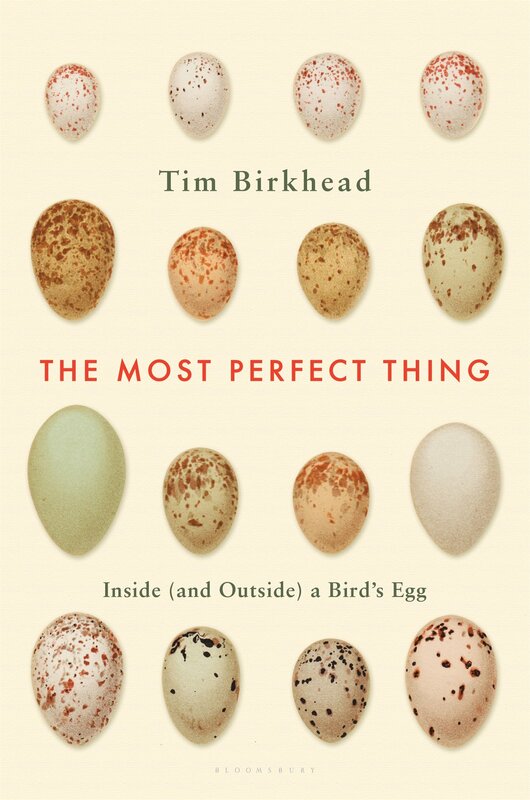 Birkhead takes us on an exploration of the egg and its formation, from the outside inward. Remember that experiment in which you leave an egg overnight in a mason jar full of vinegar? And then in the morning, you remove it to find that the hard calcium eggshell has been dissolved, leaving a sort of squishy, rubbery egg-ball beneath? This, Birkhead informs us, is roughly the egg’s state before dozens of miniscule spray guns coat it with calcium carbonate while it’s inside the female bird’s oviduct. Similarly, there are tiny paint guns that paint the intricately scrawled patterns across some bird’s eggs after the ground color has been laid down. Much of this process is a scientific mystery. Does the egg rotate in the shell gland as the paint guns fire? And why the exuberant patterns? Birkhead discusses the evolution of birds’ eggs from their earliest decor (white) to the endless adornment variations found in birds’ eggs today. Inside the shell is the albumen, of which Birkhead tells us, “there is a distinct nothingness.” We know albumen as the egg white, though it is mostly colorless unless cooked. And while to us it may seem like nothingness, for the growing embryo it supplies water and proteins, serves as a shock-absorbing system, and provides “a sophisticated biochemical firewall against microbes.” Bacteria, viruses, yeast, fungi – these are the microbial invasions that eggs have evolved to defend against, and their best defense is the albumen. In addition to containing over 100 anti-microbial proteins (that we know of), it is just a vast expanse of nothing through which a microbe would have to travel in order to get to the yolk, so much so that Birkhead likens such a passage to a human walking across Chile’s Atacama Desert. The term “polyspermy” arises here which, while it may be funny to say aloud at parties, accurately describes the intriguing fact that birds, like sharks, newts, and salamanders, require several sperm to fertilize a single ova. From the start, Birkhead sets out to take readers on a voyage into a world unknown to most of us, though we regularly sustain ourselves on its fruits. The Most Perfect Thing is ultimately the story of a vast number of adaptations to an infinite number of natural selection pressures that have evolved our planet’s current diversity of eggs and the birds who build them.